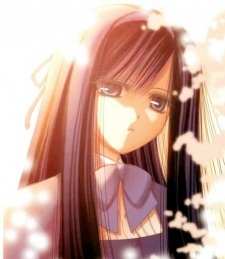 Ura Sakaki is a 16 year old second year student at Touryou Academy. Ura first crosses paths with Tamaki Kawazoe on a shopping trip. Ura saves Danjuro Eiga from flying ramen, a falling billboard sign, and a runaway purse snatcher the same way Tamaki saved Kirino Chiba and Tojari Ishida from flying balls and the falling vice principal. The Muroe High School Kendo Club feels that this meeting was fate and that Ura and Tamaki will one day cross swords. Ura is a skilled kendoka. She was a junior high national champion. When she was a high school freshman, she won fifteen straight kendo matches at Gyouryuuki, Kyushu’s largest kendo rally, before losing on the third day of the tournament. After that loss, she stopped showing up to Touryou Academy’s kendo club. She quit the kendo club because of her obsession with entertainer Junya Takigawa. Ura’s obsession with Junya started when she decided to check out an appearance he was going to make at the park near her school. He smiled towards her. At that moment, she felt like she was connected to him by a string of fate. She feels that romantic lines he says on TV and sings in songs are directed towards her. When a character he portrayed on the show Black Duran threw away his sword, she took it as a message to throw away her own. She still hasn’t met him in person.